By Xah Lee. Date: 2012-04-20 . Last updated: 2018-06-23 . Use border-radius attribute to create round corners. If border-radius is more than half of the width or height (whichever is smaller), the whole thing becomes a circle. Any of the 4 values of border-radius values can be omitted. For each border radius value, it can be a fraction, like this: border-radius:50px/10px 0 0 0. 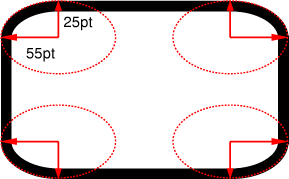 The 50px specifies the horizontal radius of a Ellipse, the 10px is the vertical radius. All major browsers support it since 2012.